Put Your Bits & Bytes Together, Create a Strategic IT Plan! Also calculate the price of doing nothing. Desribe the risks and potential costs of falling behind or failing to get ahead of competitors technologically. There’s nothing wrong or unusual about wandering the vast landscape of today’s business technology. But, at some point, every company should at least consider bringing all their bits and bytes under one roof. When you’re ready to tackle this challenge, contact us at sales@fahrenheitadvisors.com. We’ll put together an experienced team to help you manage the process. 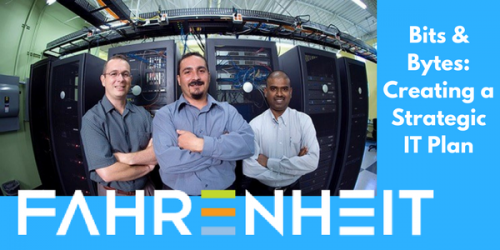 The Fahrenheit Group is a consulting and professional services firm that helps growth-oriented organizations overcome their most challenging hurdles to success. « Could a Stronger Governance Benefit Your Business?